When choosing a pet crematorium it is important that you ask the right questions before making your informed decision. A Pet Cremation Service should tell you how pets are stored, transported, handled and cremated. Many vets are now being offered incentives to only offer the pet cremation services of the weekly collection company that they may be contracted to. The way these pets are looked after is normally very basic and completely different to Nottingham Pet Crematorium. You will probably be charged the same if not more than if you were to choose our service, therefore it makes sense to ask questions and do your own research before deciding. Over the years we have built up a reputation as one of the best pet crematoriums in the country through our honest, caring and personal attention to each pet and owner who needs our service. We operate to the highest standards and guarantee your pet will receive a genuine and respectful send-off. We hope to answer some of your questions below but please feel free to contact us if you need more information. We are members of the Association of Pet Cemeteries and Crematoria. We are the only crematorium in the Midlands that has been Independently Inspected and Approved, ensuring you a first class service at all times. How do I know my pet will be cremated on their own ? Will I get the correct ashes ? These are the main question we are asked and they are in the mind of everybody who has their pet cremated with a view to having the ashes returned. It is a natural reaction to be suspicious especially as everyone seems to have heard some dreadful story about the process. The term individual cremation implies a process similar to a human cremation – one body at a time. Your pet is placed into a clean cremation chamber with a solid hearth. A label is attached to the cremator to identify your pet and the time of the cremation is recorded in a diary. The label stays with your pet’s remains right the way through the system. The cremation is carried out until only sterile bone fragments remain. Once they have cooled to an acceptable temperature they are drawn into a tray or container and all traces removed from the hearth by careful brushing. All remains must be removed before the next cremation starts. There will be some fragments of the hearth with the ashes but this is inevitable if you are to receive all your pet’s ashes. The remains taken from the cremator consist of fragments of bone. These are processed through a cremulator which reduces them to a fine ash suitable for return or scattering. The cremulator must be carefully cleaned each time. The ashes are then placed into whichever casket or urn you have chosen. The original label stays with the ashes and is carefully checked against the original cremation request. The term Individual Cremation is well understood within the pet bereavement industry but it is a term that is largely abused. 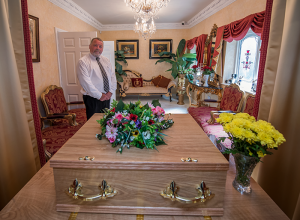 Many so called pet crematoria will try to avoid being pinned down to the term individual by using other descriptions such as ‘return of ashes service’, ‘cremation on numbered trays’ or even ‘special’ or ‘private’ cremation. If you see this you should suspect that the pets are being cremated together. There may be some kind of separation but since cremation is a volatile process nobody could guarantee the ashes would not be mixed. We do not follow this practice and guarantee that your pet will receive an individual cremation as described above. Pet crematoria are regulated through the Animal By Product Regulations and Environmental Permitting. In other words they are regulated as waste sites. Any regulation to govern standards is purely voluntary and the members of the Association of Private Pet Cemeteries & Crematoria are the only group to openly adhere to a specific Code of Practice. We are one of twenty-six members of this Association out of perhaps 150 businesses in the UK calling themselves Pet Crematoria. Always make sure the identification label stays with the pet, is attached to the machine when cremating and stays with the ashes. Never separate the label from the pet. Always make sure the cremation chamber and ashes processors are cleaned thoroughly to collect all the remains before the next cremation or ashes preparation begins. There must be no mixing of remains. The answer is normally yes subject to the licensing conditions that apply. An appointment time will have to be made and this will usually involve an additional charge. However, when people ask this question they often have very different ideas about what they want. Some may actually want to see their pet be placed into the cremation unit. This is often linked to religious beliefs but may also be for reassurance of the procedures. Others may simply want to be present in the grounds at the time of the cremation. Cremations that are attended by the owner have to be scheduled into what is often a busy day. Our working practices are the same as a human crematorium. If you go ahead there is obviously a safety issue so you would have to follow instructions from the crematorium as to where to stand and you must not try to interfere with the procedure. It is normal for an additional member of staff to be present to prevent this. There have been cases in the past where people have collapsed when viewing the cremation. 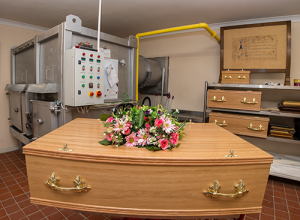 If you want to be reassured about the start of the cremation but do not want to see your pet go into the hot unit then we advise you arrange a scheduled time for the cremation. Look inside the unit before the start of the cremation. Ensure the hearth has been cleaned of all traces of any previous cremation. Wait for the unit to heat up again and arrange to stand somewhere you can feel part of the process without having to see the actual loading. The total time for the cremation and preparation of ashes will vary from about one and a half hours to four hours depending on the size of the pet. It is best to go off and come back later for the ashes but talk to us about what you want and we will do our best to respect your wishes.